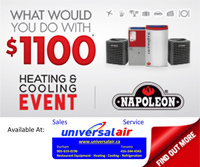 Universal Air has been providing guaranteed, dependable service in the Greater Toronto and surrounding areas since 1987. We are available 7 days a week, 24 hours per day, including holidays, to provide heating, air conditioning, refrigeration, ventilation and restaurant equipment service to our valued residential, industrial and commercial customers. 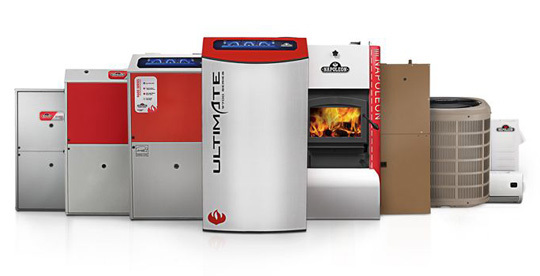 We service and install all major brands. Our technicians are certified, licensed, insured and experienced. We offer competitive pricing on all sales, service and installations. Call today for a FREE estimate on new installation of all products. 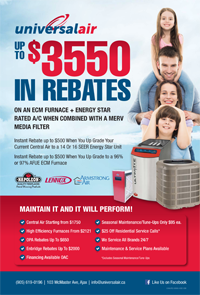 Gas & Electric Water Heaters, Tankless Boilers; Furnace & Heating Systems; Central Air conditioning; custom Ductwork; Gas Appliance hook-ups; Residential & Commercial Boilers; Air Purification; Restaurant Equipment Sales and Service. Each Energy Star certified home can keep, 4,500lbs of greenhouse gases out of the air each year. To put that in perspective, 4.500 lbs of greenhouse gases is enough to fill 275,000 one-gallon milk jugs, and because homes have such long life spans, this environmental benefit lasts for many, many years. Universal Air is proud to support the local Canadian Economy. We feature Napoleon Residential and Commercial lines. 100% Canadian.